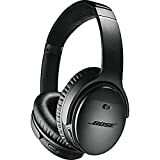 There’s pretty much no question at this point that the Bose QuietComfort 35 (Series II) Wireless Headphones are the best noise cancelling headphones that Bose has ever made. There’s also no question that at $350, they’re priced well out of reach for most people. Well, good news: Amazon is running a rare sale right now on the Bose QC35 headphones that drops the price to $299. The discounted price is good on the black and silver colors, and it definitely won’t last very long.